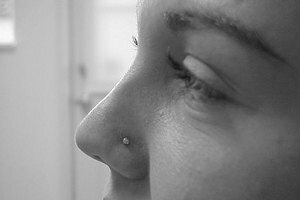 Unlike the permanence of a tattoo, a piercing can easily be changed or removed entirely. With a steady hand and the proper equipment the removal of an eyebrow piercing should only take a few minutes of your time. Prior to removing your piercing consult your physician if your skin is extremely red, itchy, infected or oozing. Gently clean the area around your eyebrow piercing with antibacterial soap and room temperature water. Be sure that the water is room temperature to avoid scalding and irritating the delicate skin around the piercing. Wash your hands thoroughly to ensure that no germs will be spread and cause an infection when you touch the area. Wearing latex gloves during the removal may be a wise option to ensure the prevention of spreading germs into your open skin. 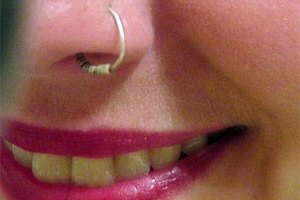 Look over how the piercing comes apart and decide the best direction for removal. Barbell type jewelry typically untwists from the top, while hoop style jewelry typically have ball in the middle that holds the hoop together. If it is difficult to see what you are doing, then it may be best to have a second mirror placed somewhere more convenient or even ask a trusted friend to help you out. Begin to untwist or unlock the metal ball from the eye jewelry while holding the barbell or hoop in place. Breathe slowly and do not panic; if you begin to feel discomfort then stop or tell your friend to stop. A gentle hand is the most important part of the piercing removal, so be certain to take things slow. After the ball is removed from the eye jewelry it is now time to slide the bar or hoop out of the piercing site. Just as before, a steady and gentle hand works best. Once again, if you begin to feel pain or discomfort, do not continue to pull because you may be doing damage. The removal should go smoothly and once the jewelry is out, be certain to place it in a cleaning solution before storage. 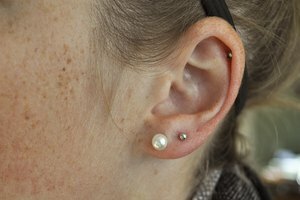 Rub the outside of the piercing with a small amount of healing antibiotic ointment to begin to close the opening. If you wish to replace the jewelry with another then again clean the piercing site with antibacterial soap and insert a sanitary new barbell with ease. If you feel any discomfort during the removal process, then stop and seek the assistance of your physician, or call the location at which you had the piercing done.